A Nyitting story from Traditional Owner Trevor Walley provides another account of how Derbal Nara or Cockburn Sound was formed through a fight between the Waugal and the Spirit Crocodile. Differing stories of the same phenomenon can be seen as complementary rather than conflicting. The following account combines three tellings of the same story by Trevor Walley. The Waugal was swimming down Derbal Yaragan when he smelt Yondock the ancestral Crocodile swimming down from the north. On his way down the river, Waugal took strength from a freshwater spring at the East Street Jetty. He also stopped in a cave in North Fremantle and took advice from Woorriji the Lizard on how to fight and beat the Spirit Crocodile. The Lizard’s advice was to bite the tail off Yondock. The Waugal swam out to the coast, which at that time, lay beyond Wadjemup, and sure enough there he encountered the Spirit Crocodile. The place we’re sitting on now [Point Peron], I believe was called “moorli borlup”. Moorli borlup is a yellow-finned whiting... And this Yondock comes down and he’s aiming for this fish here, this Point Peron here is called moorli borlup, the yellow-finned whiting fish. He’s coming down and by pushing his way in, Wadjemup was created just because of his actions. Then he started to push his way in. The Wagual and the the Spirit Crocodile began to fight and got locked into a death roll. As they rolled and tumbled, they gouged out Derbal Nara or Cockburn Sound and all the sea waters came rushing in. The Waugal was losing the fight with the Spirit Crocodile when he remembered the Lizard’s advice, and bit the tail off the Spirit Crocodile. The body of the Spirit Crocodile drifted off and became Garden Island. You can see at the northern end of Garden Island is all white cliffs. This is where the tail was bitten off. This is why the Garden Island is called Meeandip. The Waugal placed tail of the Spirit Crocodile at the mouth of the Swan River to prevent salt water coming up the river. It became a limestone sand bar. The tail is secured with hair from the armpits of the Waugal on the southern side of the river and with toenails from the crocodile on the northern side of the river. The Waugal knew that if the tail and body of the Spirit Crocodile were ever re-joined, there would be serious trouble. So, he told Dwert – the dingo – to watch over the coast and make sure that this never happened. 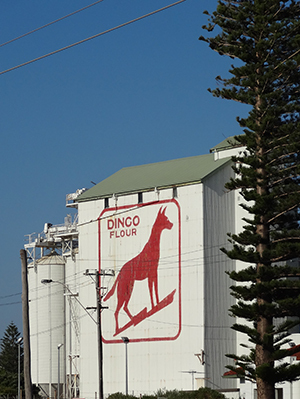 This is the site where the Dingo Flour Mill sits and the Dingo still watches over the coast. This is a sign that the Dreaming is still alive and present in this day. Click the sound files to hear the Nyungar words on this page.